When every other explanation fails, there's always stupidity. Remember that, boys and girls. Let us explain. Back at the beginning of time, when this writer wrote for the Calgary Herald and the Ottawa Citizen and the like, media folks still had expense accounts. It's true, we did. We would gather at local canteen, and dissect the latest bit of political skullduggery, and charge our beneficent corporate overlords. 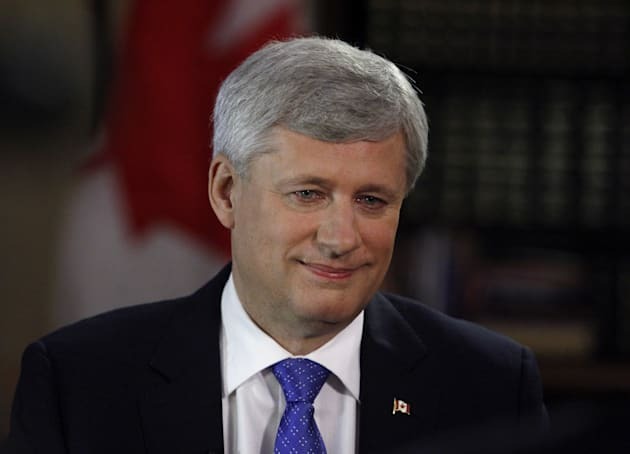 Former Prime Minister Stephen Harper. So, if then Prime Minister Brian Mulroney had declared that he intended to "roll the dice" with the Constitution, as he did, we figured he couldn't possibly mean that. Because, you know, actually "rolling the dice" with a nation's supreme statute would be utterly reckless and irresponsible, and would have the potential to destroy said nation. So it couldn't possibly be that. No way. Lots of media folks thought the then-Conservative leader knew something the rest of us didn't. Steven Harper, too. When, mid-campaign in 2015, he abruptly stopped talking about his main political strength (the economy), and started talking about an issue that absolutely no one else was talking about (the niqab), lots of media folks thought the then-Conservative leader knew something the rest of us didn't. 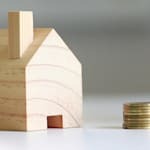 The economy is the main concern of millions (that is, millions) of Canadians, and the wearing of the niqab in a lineup had come up twice (that is, twice) in the preceding months. But Harper Is A Strategic Genius, etc. He knows what he's doing, etc. Well, no. It was knuckle-dragging, mouth-breathing, dog-whistle politics of the worst kind. It was pathetic and desperate. It was, in fact, a complete repudiation of every previous effort Messsrs. Harper and Kenney had made to, um, curry favour with New Canadians. It was like holding a hand grenade, pulling the pin, and saying, just before blowing oneself to smithereens: "Canadians will greatly admire the bold and decisive move I am about to make." 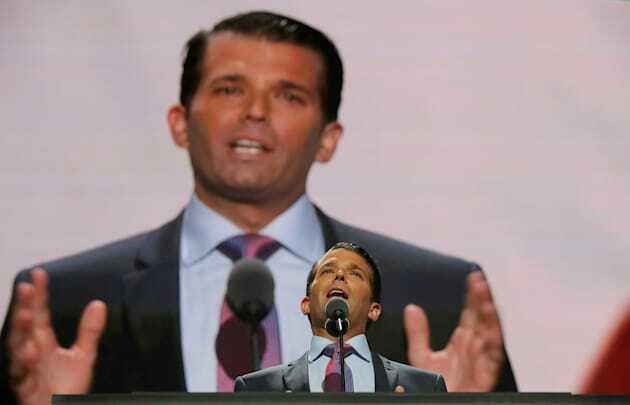 Donald Trump Jr. speaks at the 2016 Republican National Convention in Cleveland, Ohio on July 19, 2016. Which brings us, in a circuitous fashion, to Donald "Diaper" Trump, Jr.
A week or so ago today, Don was being hounded by the ink-stained wretches and wretchesses at the New York Times. They were onto a story that Diaper Boy -- aided and abetted by his brother-in-law, and his father's top campaign boss -- had met with Russian operatives in June 2016 to receive damaging information about Hillary Clinton. The Times didn't have the documentary proof, however. They just had dribs and drabs from three anonymous sources. Don and the geniuses at the White House serially offered up a variety of explanations for the meeting, none of which made sense, and none of which were actually true. But it was still the Donald Jr., on the record, versus three anonymous weasels, largely off the record. It was a plausibly deniable position, because there was no paper proof. So, what did Don do? He gave the media proof. Ho ho ho, the Trumpkins crowed. Donny showed the Deep State! He stole the scoop away from the Times! He went first, and owned the news cycle! He defined the story before it could be defined! He's a genius! Nothing burger, etc.! Don gave the news media the entire email exchange between himself and some crypto-Soviet sleazebag, who told him -- and we are putting this in all-caps, because it actually merits it -- that: "THIS SENSITIVE INFORMATION IS PART OF RUSSIA AND ITS GOVERNMENT'S SUPPORT FOR MR. TRUMP." Upon receiving this "sensitive information" from the Kremlin, did Don go to the feds to report a possible crime? Did he notify the media and summarily condemn it? Did he take steps to protect his father, who was losing to Hillary Clinton at the time? Don has now handed Robert Mueller, the special counsel probing all of this Trumprussia stuff, the proverbial smoking gun. Um, no. He cheerily went to the meeting, at Trump Tower, and he helpfully brought along his brother-in-law (who now works at the White House, and is under criminal investigation, because Russia) and the top campaign boss (who is now registered as a pro-Russia lobbyist, and is also under criminal investigation, because Russia). And, three days later, the hacked Clinton campaign emails started to spill out. The general consensus is that Don has now handed Robert Mueller, the special counsel probing all of this Trumprussia stuff, the proverbial smoking gun. He has offered the proof that no one previously had: namely, that Donald Trump -- and his family, and his most-senior campaign operatives -- knowingly received and accepted an offer of collusion from Russia. Sometimes, boys and girls, there is no grand strategy. Sometimes, there is no diabolically clever tactic being deployed. Sometimes, it simply is what it looks like.